Why am I an entrepreneur? What is my own motivation? What do I want? How do my motives for being an entrepreneur fit in with my vision for my life? I have found that being conscious about my own motivation is key to ensuring that I can gain fulfilment from being in business. Why does my business exist? What's the purpose of the business? Deciding on a clear purpose for your business gives coherence to all your actions and decision. For me, that comes down to identifying what this business is going to do to provide value to others and make other people's lives better. Am I going into business with others, or alone. Why? This choice has huge ramifications and it is extremely useful to be very conscious of why you are making any choices with regard to cofounders. Why do I want funding? What am I going to do with it? It's easy to assume you need as much money as possible to start, but you have many choices as to how to approach financing the venture. How am I going to make money? Why will customers give me money? There is an interplay in this decision, as we all learn from customers as we come to understand their reasons for buying. How are we going to organise the work? Why are we working in this way? There is often a temptation to recreate the processes from your last job, however being a business owner gives you the opportunity to consciously design the workflow of your business. How much profit do I aim to make? How am I going to do it? How big do I want this business to be, and why? It's easy to assume that you want growth, but bigger means more complex. How do you plan to exit the business? Everyone has to exit someday. 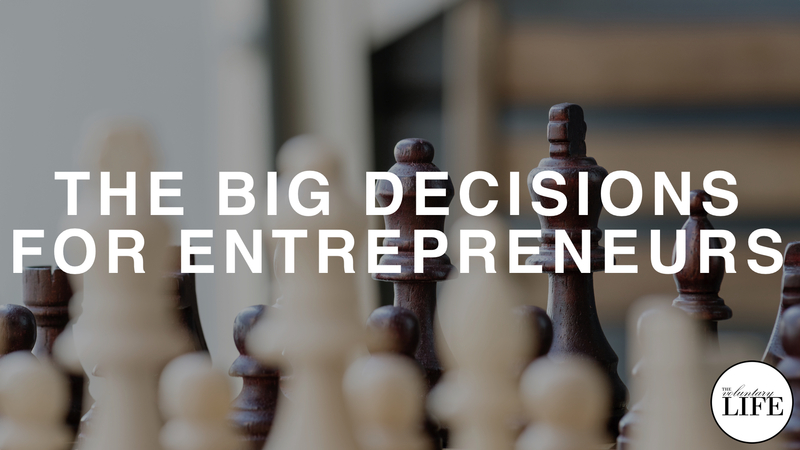 Many entrepreneurs want to sell, but even those who don't will have to plan for some kind of exit, either through a succession plan or simply ceasing to trade one day.